Actually the theory states that both man and monkeys evolved from a common ancestor that was more like a lemur. We didn't evolve from monkeys and they didn't evolve from us, we are two branches on the same evolutional tree. There is nothing I can say that will convince a person who believes that every word in the bible is God's spoken truth. Since much of the book contradicts the rest, I find this a non-starter for me. The whole creation myth is fine allegorically, but when taken literally it's just plain nutty (especially when the evidence is as plain as the computer screen in front of me that it is manifestly a myth). If people want to believer that several billion animals got on a boat and floated around in sea water 31000 feet deep (water that would have killed either all the salt water or all the fresh water animals in it, by the way) and that Noah stopped off all over the world dropping off different kinds of animals where they ended up (all of the lemurs in Madagascar and nowhere else, all of those marsupials in Australia and nowhere else, the cichlids in the African rift lakes and nowhere else, the dinosaurs to wherever it is they were supposed to be left, all those millions and millions of now extinct species that we have in the fossil record but who are now gone, the endemic animals in all the pacific islands and nowhere else) well then there's not a chance in heck that a rational discussion will ensue. Yeah the flood. Other people would have had boats. "To those who have faith, no explanation is necessary. To those with no faith, no explanation is possible." I have a Baptist buddy who said "Peyton Manning is the best QB ever, and he's going to RULE the Super Bowl, you just wait!" "To those who are willing to suspend disbelief no matter how obvious and plentiful the evidence against said belief is, no explanation is possible. Everybody else is just kinda shaking their heads in wonderment at the thought of living like that..."
I see a lot of opinions in this thread and no facts. I always chuckle when someone says global warming is fact, or evolution is fact or even the big bang is fact. Given the amount of distrust for the media and politicians, particularly on this website, people tend to be quick to trust scientists. When you start reading the Bible you will find that it is entirely scientifically accurate. Science is just a way of trying to discover, explain and figure out the wonders and works of the Creator. Hebrews 11:3 says we are made from things we cannot see. Man didn't figure this out until the 19th century. Leviticus 17:14 says the life is in the blood. It has been just over 100-150 years ago that they finally figured that out and quit "bleeding" sick people. The Bible always did say the earth was round. Isaiah 40:22 said it all along. Job 38:24 said light can be parted or separated. Took man all the way until Isaac Newton to figure that out. Psalm 8:8 mentioned the ocean currents which were not discovered until the 19th Century by Matthew Maury. There are springs in the ocean. Mankind didn't know that until the 1970's, but it was in Job 38:16 all along. Air has weight. We didn't know that until about 300 years ago, but it was written in Job 28:25 all along. Job 36:27-28 accurately describes the Hydro-logical Cycle although it wouldnt be discovered until about 2,500 years later. This list could go on for awhile, but you get the point. You dont have to pick either science or the Bible. Both go hand in hand. Science does not contradict the Bible. Some THEORIES do, but not proven science. How could it? One is the works of God's Hands, the other is the work of His Word. In seeing Mike's post about trolling differing religion threads this might be best here in the general section. I hope this just to be an exchange if ideas and not a shooting match. Please pass if you're not comfortable discussing such. I am curious as to how you folks of faith deal with science. More-so, how do you reconcile various issues within your own mind? How do you explain such issues to your kids? For instance do you believe that a small part of our genetic makeup comes from Neanderthal, as stated in the article below? Ultimately, if there is a God who created the universe, then all of creation will bear out facts that attest to this creation. Throughout history, many, if not most, of the scientific fallacies and errors have been those which blatantly contradict the truths of scripture. 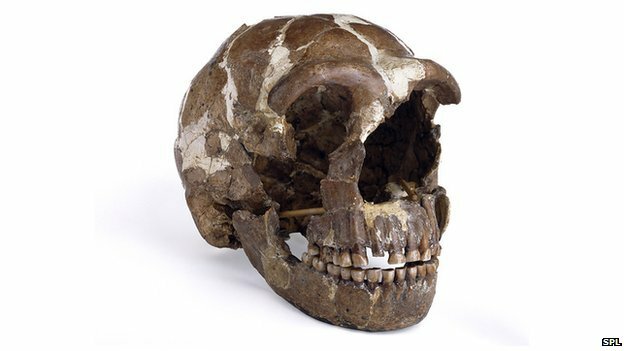 As for the Neanderthal, it was not a separate species. If it were, by definition, its interspecific hybrid offspring would have been infertile. Or have they changed that criterion of speciation to fit their conclusion, making the data fit the conclusion, instead of drawing a conclusion from the data? In the final analysis, Neanderthals will prove to be humans like any other, possibly suffering from Ricketts' Disease, a form of Vitamin D deficiency, possibly arising from living in caves. IMHO -- If you think science, as represented in journal articles, popular news reports, and Nova is objective, dig a little deeper. I suggest The Structure of Scientific Revolutions by Thomas S. Kuhn. There is a big time monetary payoff for jumping on the popular theory bandwagon and defending it to the death against all challengers. University positions, reputations, book deals, research jobs and the like depend upon bolstering up the currently accepted theory (such as the theory of evolution) and getting the stamp of approval from the reigning theoreticians. I kind of think of it like this: Religion is how true spirituality get expressed after man has worked it over. Popular science is "the way things really are" after man has worked it over. I don't trust religion and I don't fully trust science. And yes, I have been a pastor and am currently preaching. And, have degrees in mathematics and physics. But I do believe in God and believe all of this creation is fearfully and wonderfully made. In the simplest, most distilled, least wordy and uncomplicated, stripped down explanation I can give is that as a person of faith, I believe in God's supremacy, and therefore I believe that He can do anything He wants. To repeat, that is the distilled essence of a lifetime of studying Christianity and other religions, of searching the scriptures, of striving to understand God's word. And in that creation, we see evidence in the fact that there even exist descriptive laws that there must be an ordering of the design. The same ordering of the descriptive laws affirm our implementation of prescriptive laws in the image of that Creator. Some of us ARE scientists. My wife, for example, has multiple post graduate degrees. I myself have a PHD although mine is in history, not science. My wife teaches this stuff at a top university, has had peer-reviewed papers published in top journals in the biological sciences (not getting specific due to opsec, it's a VERY small field and anybody who is anybody could figure out who it is by where we live...). Feel free to ask any specific scientific question, and I will be glad to have her answer it... especially anything about evolution. I guarantee you that you will get any/all the information you desire. So hit me up, sir. Let er rip, what do you want to know? Be as specific as you like, in fact, the more specific the better. Here's the proof of Aquinas' statement, to which he is entitled. I too have multiple degrees in science and worked in the field of molecular biology in various disciplines for many years. In the three places I worked, the majority of people I worked with--other scientists-- were people of faith. I think people who have never worked closely with the hard sciences have the impression that being a scientist of whatever sort automatically confers a lack of faith, but it just isn't so. I worked with an immunoligist who at the time was about 65 (back in the late 80's). He told me as over his lifetime, as he learned more and more about how the human body works and how cells develop and function, he came to believe that there must be a 'prime mover' who set it all in motion. He said things functioned too perfectly for him to believe it was just all evolution. I wish I could remember his exact words because they framed what I had thought and tried to verbalize for many years. Anyway, just my experience of working in the hard sciences that there are probably just as many people of faith as there is in the general population. Having a PhD doesn't make one automatically reject faith. ETA and unless I missed something important, physicists still can't agree on the origins of our universe. And yet, here we are. Very nice everyone. I appreciate your input and it all has been very civil. Seriously. Take a bow! What spurred my interest was after reading that article I wondered if various people of faith can accept that we did evolve from humanoids. That is evidenced via DNA. If a person were to deny that could he, or she accept DNA evidence in a criminal trial or in a paternal screening? See how things can get complicated? people tend to be quick to trust scientists. Could not agree more. If people would only take the time to learn a bit about the background of the issue (meaning you need not be a rocket propulsion expert to know the fuel makes it go up in the air) and then use their knowledge to look at the RAW DATA in the scientific studies BEFORE forming their opinion (better said copying an opinion from a scientist) we would be better off (imho), but I know that is like asking a lifer EBT'er to actually get a job, so not holding my breath for that to happen in anything but statistical insignificant numbers. There are bad apples in every bunch (and yes it does tend to spread and yes it's unfair that the good ones without agandas often and quickly get painted by the same scientist brush), there are also numerous others with AGENDA'S and untold numbers with AGENDA'S will do whatever they must (including manipulation of RAW DATA, see global warming altered data as a prime example) to advance their AGENDA. I think that we are all pretty safe in trusting main stream science. It might not be 100% correct, but it does change when facts are presented. It is our very best understanding at any particular point in time. I'm not talking about junk science or corporations that pay people of high credential to pervert or distort things. I am referring to real peer reviewed science. There is always someone checking the checkers to find fault. Media, news and politicians do not rate this topic... at all. Oil and water. Just gander for a moment what it took to engineer and put into a very specific orbit Voyager I and II. Pure hard cold science. Even more impressive just think how hard it was for Copernicus to deduce that everything in our solar system rotated around the sun with crude instruments, his own observations and math. That's to say nothing of the climate in which he worked. See, this is it at the core of it... people who argue against "science" and "scientists" just google their specific beliefs and cut and paste quotes from the first person who agrees with them in the google rankings. That has NOTHING to do with science. It has NOTHING to do with understanding data presented in peer reviewed publications and at peer-reviewed conferences. It's just some guy or gal with an agenda (and generally that person isn't even in the field they are blabbering on about). That's why I said feel free to ask any questions you may have here about, say, evolution... and I will get you the answer from a real, live, breathing scientist who has been published as lead author in peer reviewed journals (I can't list them for opsec, because it's a pretty specific field) many times, and who has been teaching both collegiately and in medical schools for 25 years along with doing lab research and teaching lab research. Knock yourself out, here's your shot. Free education, just for the asking... her college kids have to pay thousands a year for this stuff, but we offer it here for free, no charge.